Using multiple sources to assess your social media presence is not necessary but can be quite helpful. 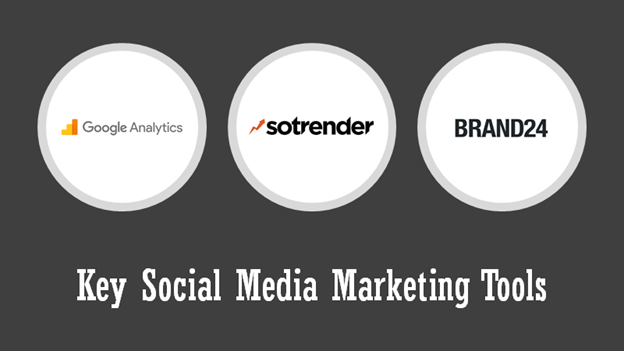 Tools like Sotrender can give you very good insights into your performance on social media channels such as Facebook, Instagram, Twitter & YouTube in terms of reach, engagement, communication strategy optimization and much more. However there are some things which are better done with other tools. While we’re proud of the quality of the product that we have here at Sotrender, we know there are other tools which can complement ours quite well and can offer different features which can be helpful for marketers and agencies. In this piece we’ll be talking about tools such as Brand24 and Google Analytics which can concurrently be used with Sotrender to get the biggest insights into your communication strategy and presence online. Since we know social media isn’t everything, getting to know what others are saying about you on other portals and forums such as Reddit or any other platforms, websites and so on we use these tools in order to further explore what people are saying about your brand all over the internet and what kind of buzz is being created through the publications of external agents. We know what you’re probably thinking though. How is Google Analytics a Social Media Marketing tool? Well the answer is simple; while dedicated social media tools are there to serve a specific purpose, Google Analytics helps you dig deeper into what your users are doing after they visit your website from social media platforms! It’s really as simple as that. Here’s how we would suggest using social monitoring and listening tools to get the most out of your communications strategy and maximizing the use of PR value generated from all around the web. Brand24 is quite a useful tool when it comes to social listening and setting up alerts for keywords or phrases which you want to monitor. An example would be setting up a keyword such as World Cup or #worldcup in order for the tool to track it for you and notify you when there is a buzz around it or as they call it a storm alert for the tracked keywords. Using Sotrender and Brand24 plus ones such as Google Analytics can help quite a lot in making sure all marketing activities are tracked and quantified in ways that would allow for the analysis and most importantly – improvement. Let’s consider the following scenario. You’re a social media marketing manager at a mid-sized agency and want to create reports for your clients to measure the effectiveness of your proposed campaigns and projects that you’ve worked hard on for the past few months. Now, how can you create a comprehensive report which will make the information clear while providing data which will be concrete and hard-hitting hence proving that what you did was beneficial for the client? We think we can help you out there. So let’s say you got a project this week from a brand looking to find influencers to sponsor and wanted to create a campaign to promote a new product about to be released to the market. You’re probably going to do some market research, saw some competitors, will try to figure out who valuable influencers might be for the target market segment of the client which you’ve been provided with and you want to try to build different persona profiles of these segments to try to align the message, medium and the delivery to the audience well. Sounds about right so far? Good, let’s keep going then. There are a bunch of ways in which you can go about this. Using one tool on its own might not be the best approach because each is geared towards a specific purpose. 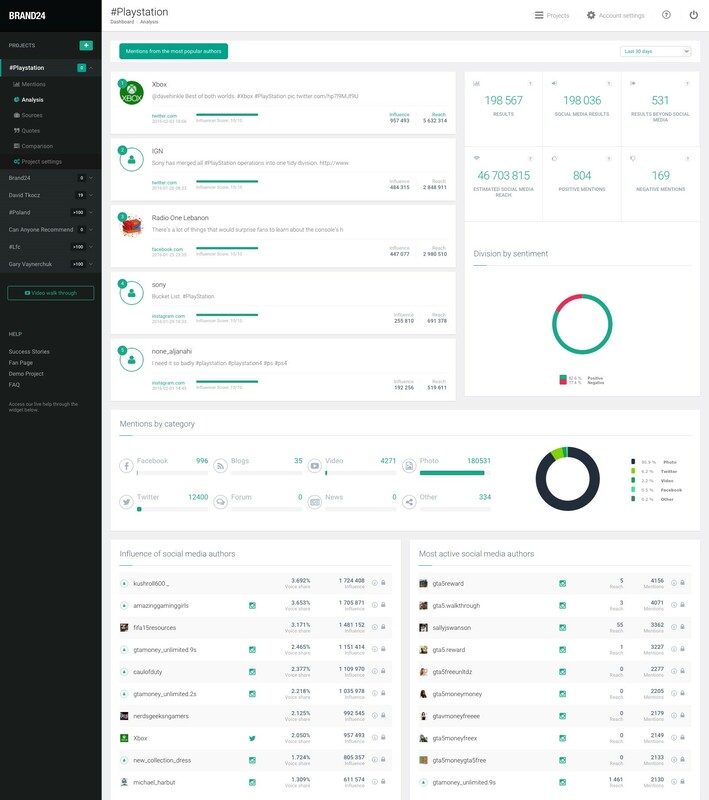 Sotrender is most useful for assessing social media presence on platforms such as Facebook and Instagram, generating reports and creating marketing strategies within the tool to help you assess the most effective way to tackle and approach campaigns. Brand24 on the other hand is good for social listening and tracking specific mentions of the brand on a multitude of platforms and websites across the web in order to follow the buzz generated around your brand and monitoring specific campaigns. These reports can be generated either as pre or post-campaign launch to either see where things went right or to figure out what would be the most effective way to approach a certain campaign. Google Analytics serves a completely different purpose where the final website traffic generated can be assessed and tracking of paid marketing is quite effective. The platform provides you with in-depth insights into the traffic generated from marketing campaigns and can show you which were the most effective and what platforms were the biggest in terms of conversion into paying clients if that was the main aim of the campaign. If the main goal of the campaign was to generate more likes on Facebook for a specific brand or to raise brand awareness then simple website traffic can be used or in this case Sotrender would be more effective. 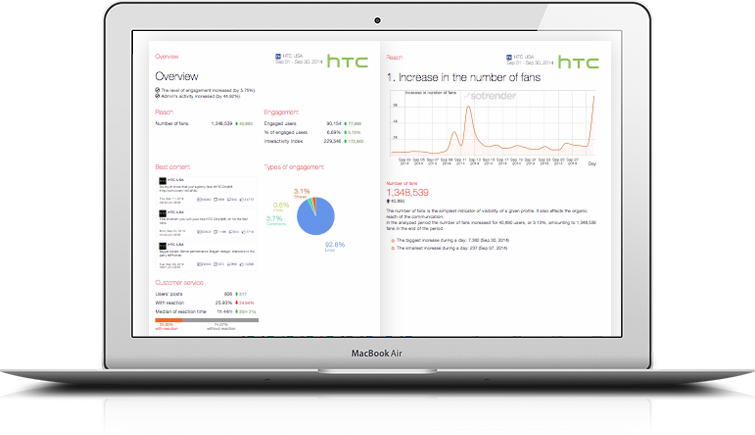 Generating automatic reports for the pages you manage or those of competitors. This information can also be monitored from within the tool once the profiles you manage and those of your competitors are added. The information that is retrieved ranges from the growth of number of fans to a heat-map of the Interactivity Index – a composite metric created by Sotrender to help marketers assess the efficacy of their social media activities. Ordering reports to identify the audiences of a certain target market segment using our Audience Scan research targeted at Facebook. This report for example gives you in-depth insights into the audiences, their demographics, behaviors and can help you build a proper rationale for your campaign. For example, this can help you as an agency to identify influencers for brands to associate themselves with or sponsor and be featured on as well as a multitude of other uses such as exploratory market research to establish a primary customer base profile for B2C companies. Competition benchmarking and tracking. 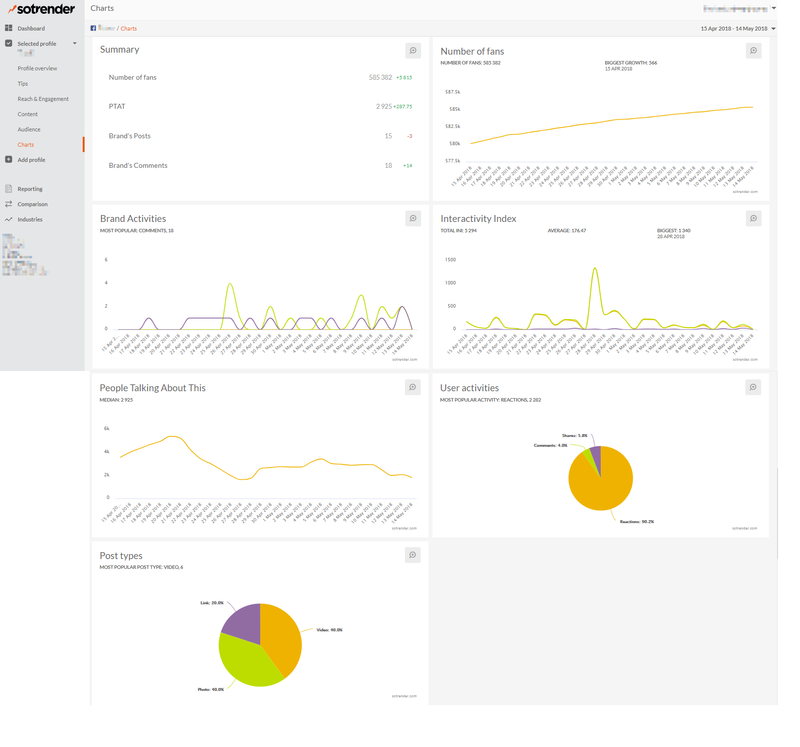 This is one of the most popular features within Sotrender since it allows you to track your competition and see how they are performing and benchmark your brand (or that which you’re managing campaigns for) against the main competitors within the field. 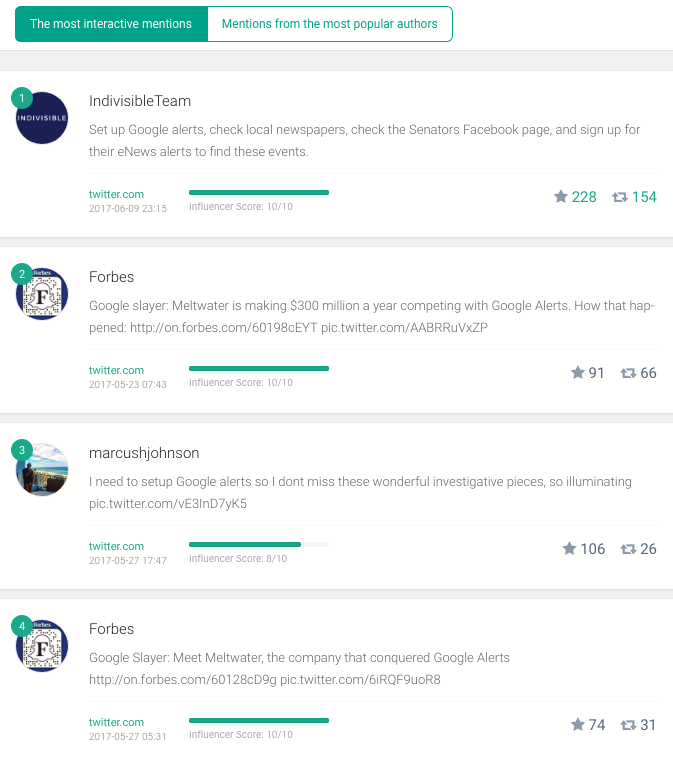 This feature is also complemented by the research reports since those allow you to find out which competitors are the most aligned with your fanbase or target group as a first step. Automatic reports can also be generated for specific groups of profiles which are set for benchmarking. Supreme social listening on a multitude of channels – this includes literally almost any website you can think of. 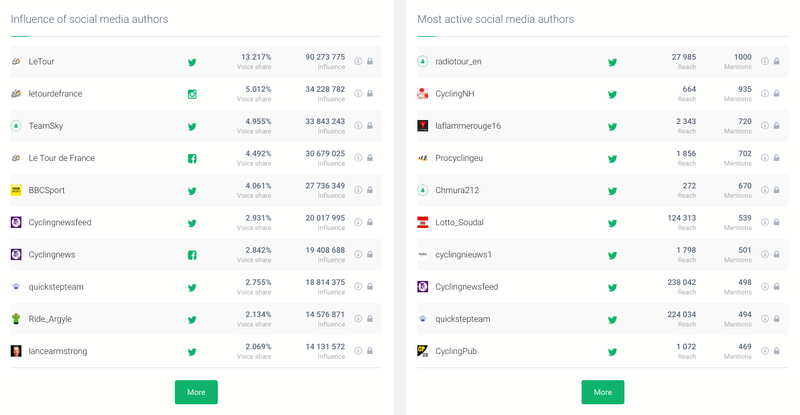 This can help give you an idea of who is talking about your brand, in what way and how influential the mentions are on a score of 1-10 which is based on the number of followers/website traffic for example. Tracking the different sentiments that come along with the mentions or posts related to the brand online. While this is not 100% accurate due to the developing field of sentiment analysis (especially when it comes to identifying sarcasm for example), it still gives a good idea of the overall sentiment around the posts. Working continuously to improve your online image and presence (even if it’s through others). This is very important where people are influenced by the different reviews or opinions they read online and would be averse to buying your product or service for example even if they see one bad review which seems legitimate and in that case might use a competitor instead because of this momentary doubt. Tracking traffic to your website with detailed information on demographics, behavior on the website, sources of traffic and other metrics which can give details on how users are arriving to your website and how they’re using. Setting goals for purchases and other actions that website visitors undertake and being able to identify the sources of those goals met in order to be able to further analyze the bottom line that you want to achieve and how you’re getting it – or to put it more bluntly, this is how you figure out what brings in the cash. Using Google Analytics with other CRM systems in order to be able to better guide your visitors through the website and make sure they follow the path you believe would be the best for them to understand what you have to offer and whether it fits them which is very important. Even if you can make a quick buck selling more to people who won’t even use your product or not be returning customers, in the long run this is not a good idea – no matter what kind of circumstances you’re operating in. Whether through legal fees for defending false advertising claims later to bad reviews on rating websites and other word-of-mouth issues that you’ll face, it will always be a loss. A client comes to your agency. They ask for a few campaigns to be run for a product launch that’s happening in two months. You figure out the terms of the agreement and have it set in place (incl. demographics, target market segment and personas). Add the social media profiles of the brand and their supposed competitors to Sotrender’s platform. Add the campaign terms, hashtags and other key words (which competitors might be using for example) into Brand24 in order to start tracking what people are saying about these topics in order to identify possible tones, wording and graphics to be used in the campaign. 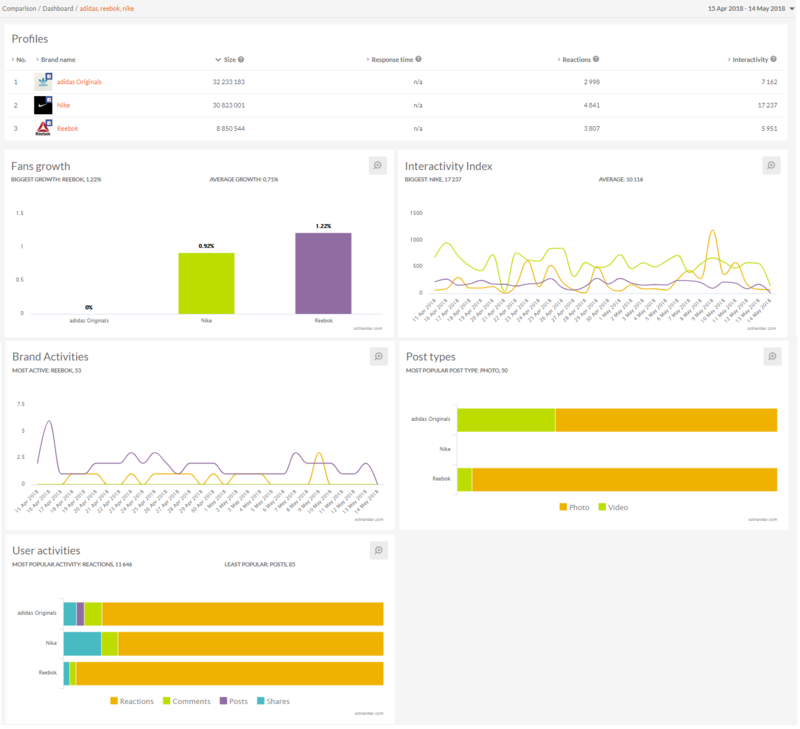 Track the growth of fans, impressions and interactivity indices on Sotrender to figure out the best performing posts and when to post them. If needed, order a report from Sotrender in order to better identify and verify the target audience group which had been agreed upon with the client. Prepare the material for the campaign. Run a few test posts at times when activity is not very high in order to gauge the reaction of the audience to the campaign materials. Reach out to a few portals in order to announce this product release and try to get some buzz around the topic. Assess the reaction from organic appearances of the brand’s keywords and set campaign monitors that had been put in place. Gauge any increase in website traffic and any customer behavior associated with the campaign (using tracking URLs and so on) through Google Analytics. 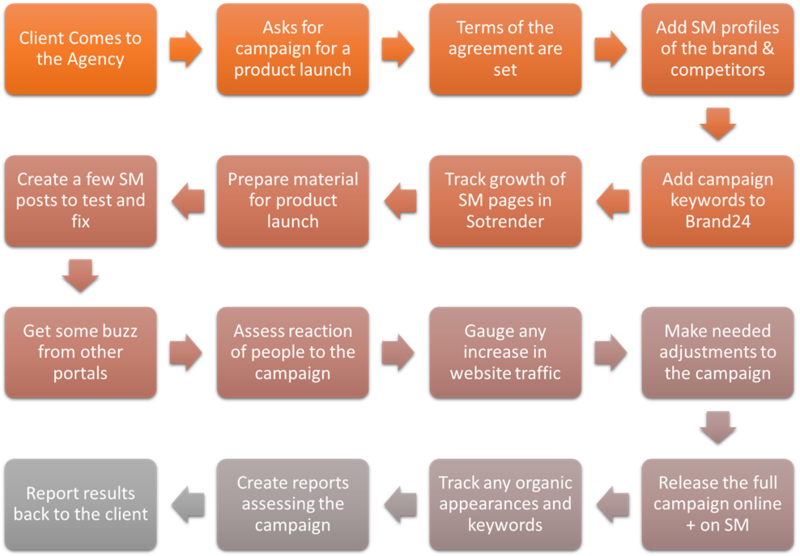 Make any needed adjustments to the campaign and publish the main campaign as previously planned while continuing to monitor any changes in the engagement rates, reach and growth of the number of lies or followers for example using Sotrender to track any other organic appearances of the brand or product-related keywords on other portals using Brand24 after the campaign is done, create reports using Sotrender and Brand24’s automatic reporting tools and through exporting data from Google Analytics to assess the successes and failures of the campaign as a whole and specific aspects of its performance in order to create a continuous improvement plan for the next report all of these back to the client. 1) Verifying data from different sources. Even though we’d like to believe that all the data from all sources which we use is 100% accurate and is tracked in the same way across different platforms, this is simply not the case. 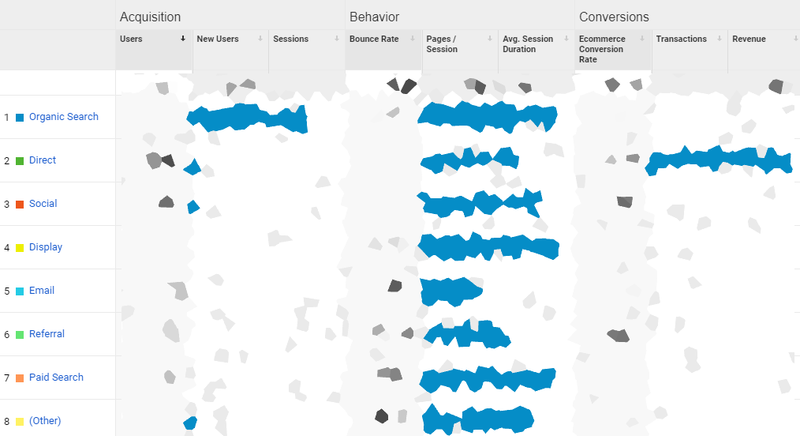 Data from Sotrender may be different than what you would receive on Brand24 and different when you use Google Analytics if you’re tracking website traffic for example. We’ve noticed some inconsistencies with using Google Analytics and other software for KPI tracking and have found some inconsistencies within Google Analytics itself on numerous occasions which caused data discrepancies. 2) Get better, more in-depth insights into the work being done and the results generated by the marketing team. This enables you to show your results much easier and cross-reference them to show how different factors are affected based on what area you’re working on; whether it’s your presence on social media, your online presence in general or how others perceive you online. 3) Be able to make better marketing decisions. Once you see the flow of information between these different platforms and are into the intricacies of how one thing affects another online you will be able to use and dissect the information provided through these services to the benefit of your company.